Saudi-Led Coalition Strikes School Bus In Yemen, Killing At Least 29 Children The children were on a field trip when the airstrike hit their bus in Saada province, aid groups say. The coalition, which is backed by the U.S., says the strike was a "legitimate military action." 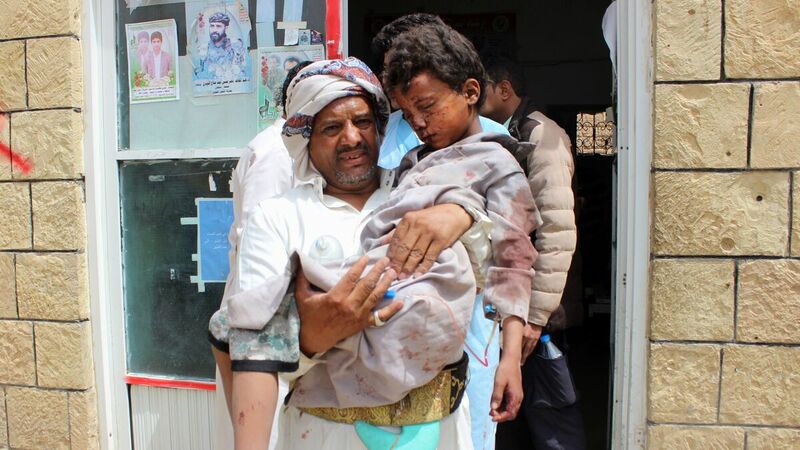 A man carries a wounded child to the hospital Thursday after the Saudi-led coalition carried out an airstrike on a crowded area in Houthi-controlled Saada province. At least 29 children under the age of 15 were killed in the attack, according to the International Committee of the Red Cross. Dozens of students were returning from a summer camp when their driver paused to grab a something at a market in Yemen's Saada province. It was there, as the students sat waiting to resume their journey home on Thursday, that a Saudi-led coalition airstrike hit their school bus. Hours later, well after the blast's violent rumble gave way to sirens and the victim's screams, a clearer sense of the human cost has emerged: At least 29 children under the age of 15, some as young as 6 years old, were killed in the attack, according to the International Committee of the Red Cross. Citing "local officials," the head of the international aid group's delegation in Yemen says that in total at least 50 people died and dozens more were injured. United Nations Secretary-General Antonio Guterres condemned the attack in a statement released by his spokesperson, saying he "expresses his deepest condolences to the families of the victims." "The Secretary-General calls on all parties to respect their obligations under international humanitarian law, in particular the fundamental rules of distinction, proportionality and precautions in attack," his spokesperson, Farhan Haq, said Thursday. "The Secretary-General emphasizes that all parties must take constant care to spare civilians and civilian objects in the conduct of military operations." And Guterres called for a prompt independent investigation into the incident. Saudi Arabia, the driving force behind a coalition of its Arab neighbors, saw no reason to apologize, however. In a statement released through the state-run Saudi Press Agency, Riyadh called the airstrike a "legitimate military action" conducted in accordance with international law. The coalition's spokesperson said the operation sought to target the militants responsible for a missile intercepted over Saudi civilian territory on Wednesday. Upon interception, Saudis say the missile exploded into fragments that killed one Yemeni civilian and injured 11 other people. "The Coalition will take all necessary measures against the terrorist, criminal acts of the terrorist Iranian-Houthi militia, such as recruiting child soldiers, throwing them in battlefields and using them as tools and covers to their terrorist acts," coalition spokesperson Col. Turki al-Malki said in a statement. The Iran-backed Shiite militia has controlled Yemen's northwest, including Saada, since ousting the country's internationally recognized government from the capital, Sanaa, in 2014. It is with the stated aim of dislodging the Houthis, and restoring the previous government, that the Sunni coalition has waged a years-long airstrike campaign in the country with the support of the U.S. Since large-scale fighting erupted in 2015, the ensuing violence has left more than 10,000 people killed and the country's health infrastructure so badly battered, nearly 18 million Yemenis lack reliable access to food. Norway Refugee Council Secretary-General Jan Egeland described Thursday's airstrike differently: "grotesque, shameful, indignant." He asserted that it evinces a "blatant disregard for rules of war when [a] bus carrying innocent school children is fair game for attack." Houthi media broadcast what appears to be graphic scenes of the aftermath, depicting children drenched in blood and burned black by the blast. They wail in pain as medics attempt to treat them, standing beside boys missing limbs and gazing on with shell-shocked stares. The frame then hovers over what appears to be a pile of bloodied bodies, unmoving. Asked about the airstrike by the U.S.-backed coalition, State Department spokesperson Heather Nauert told reporters "we are certainly concerned." "We call on the Saudi-led coalition to conduct a thorough and transparent investigation into the incident," she said. Thursday's attack marks a grim milestone in a war that lately has seen yet another escalation, as coalition-backed Yemeni government forces have made a recent push to reclaim the key port city of Hodeidah from rebels. Just last week at least 55 people died in the city during a particularly bloody exchange of fire in residential areas and outside a hospital. "How many more children will suffer or die before those who can act, do by putting a stop to this scourge?" UNICEF Executive Director Henrietta Fore asked. "It's hard to believe we live in a world where children should live in fear of such attacks, yet here we are," she added. "This doesn't have to be their reality though. Parties to the conflict and those who have influence over them, including Security Council members, can and should choose to end this catastrophe for the sake of Yemen's children."